Radiostudio Zürich. Sound engineer: Martin Pearson. Cover art: Christoph Hauri. Graphic design: Jonas Schoder. 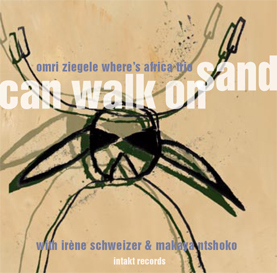 Those who were surprised five years ago at how little “Africa” was on the first recording of Omri Ziegele und Irene Schweizer Where’s Africa (Intakt 098) will be astonished now how “African” this second Where’s Africa CD sounds. This is not only because of the nostalgic pieces of Dollar Brand, Chris McGregor and Johnny Dyani, and also not only because of Ntshokos discrete drumming; it is because of the attitude that is indeed so altogether un-European. See, in Europe music is not allowed to be so outrageously beautiful, so merry with melody and sound, so unbroken and touching – especially not contemporary jazz. But: Omri Ziegele’s Where’s Africa-Trio is far from being a colourful acoustic travelogue about townships romantically jazzed up. It is rather the result of long journeys through forty years of fiercely lived – and sometimes suffered – history of jazz. In the course of this history a lot of things simply settled: the vain virtuosity, the desperate originality, the bathos and the hysterical forced happiness, the false complexity and the pompous art gesture. The remains of the long journey to oneself is this masterpiece. Los ging es im Zürcher Café Casablanca, wo Omri Ziegele und Irène Schweizer während Jahren ihr Herzrepertoire spielten. Die CD “Where’s Africa”, die im Jahr 2005 erschien, präsentierte die Summe ihrer langjährigen Zusammenarbeit und fand auch international grosse Beachtung. Seit über fünf Jahren arbeitet das Duo immer intensiver mit dem südafrikanischen Schlagzeuger Makaya Ntshoko. 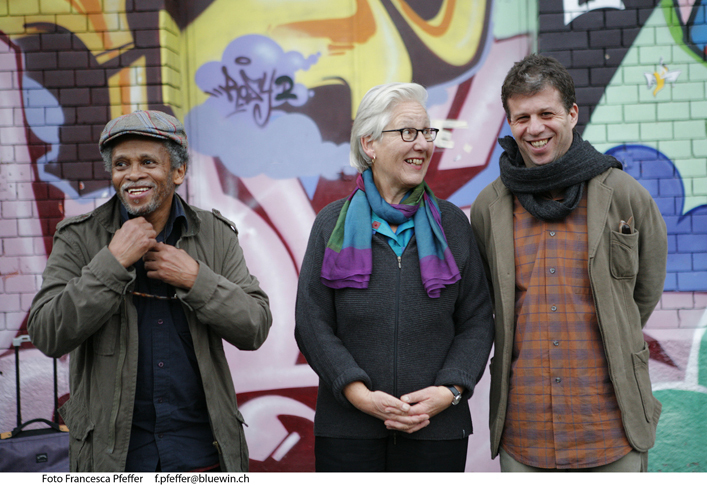 Das Trio spielt Songs aus der Heimat Ntshokos von Johnny Dyani, Dudu Pukwana, Dollar Brand u.a. Aber auch seltene Trouvaillen von Don Cherry und Ornette Coleman. Die neue CD ist voller schwarzem Blues und explosivem Howling, immer melodisch und dem erdigen Beat zugetan: Ein Feuerwerk der Emotionen. Neben südafrikanischen Stücken und ausgesuchten Balladen von Übersee, spielt das Trio auch Stücke aus der Feder von Omri Ziegele. Der Saxophonist, der so oft den ungeschminkten, rauen Ton sucht, zeigt sich hier von seiner besten Seite und überrascht mit Melodie, Eleganz und Zartem.